This gluten free and vegan mug cake for two is an absolute must any time you are craving a quick and convenient chocolate fix! The best part is that this is a healthy mug cake recipe using natural sweeteners, healthier flour options, no eggs, and no oil! I’m OBSESSED with these chocolate mug cakes!! I love them for so many different reasons. If you are anything like me, there are some days where all you can think about is cake. You need it and you need it now, haha! The only problem is that you don’t always have time to make a full cake. Not only that, you might not want to have an entire cake in the house. My husband and I are trying to make healthier choices this year so cake hasn’t really been in our vocabulary lately. Healthy Chocolate Mug Cakes to the rescue!! I loved coming up with this recipe. It took a few tries to get the recipe just right, but the end result is SO delicious! Since then, I’ve made them four more times. They might be just a little too convenient haha! I’m so excited to have this chocolate mug cake recipe figured out just in time for Valentines day! It was important for me to have this recipe make two mug cakes, because I wanted to be able to share with my husband. You could very easily half the recipe if you just want to make one or double it if you need to serve more. Whoever the wonderful person is that came up with the first microwave cake recipe seriously deserves a prize! I can’t wait to try even more flavors! Cocoa powder: To make the cake chocolaty of course! Vegan chocolate chips: These are optional as they are not refined sugar free. Any time I add chocolate chips, I use “Enjoy Life” brand vegan chocolate chips. Combine Dry Ingredients: Whisk together dry ingredients in a small bowl. Add wet ingredients: Add your wet ingredients to the dry ingredients and whisk until combined. Mix in chocolate chips: If using, mix in chocolate chips. Add the batter to mugs: Pour the batter into two microwave safe mugs. Make sure you get roughly the same amount of batter in each much so they cook evenly. Cool: Allow to cool about 10 minutes before eating. Add Toppings: Optionally top with dairy free whip cream/ice cream and strawberries. Pour the batter into two microwave safe mugs. Make sure you get roughly the same amount of batter in each much so they cook evenly. Allow to cool about 10 minutes before eating. Optionally top with dairy free whip cream/ice cream and strawberries. Not all microwaves cook the same. I advise watching the cakes while they cook the first time you make them to insure they do not overcook. Check them around 2 1/2 minutes to see if they are done. The cakes will be done when no liquid remains on top of the cakes. Here are some items I used to make this recipe. 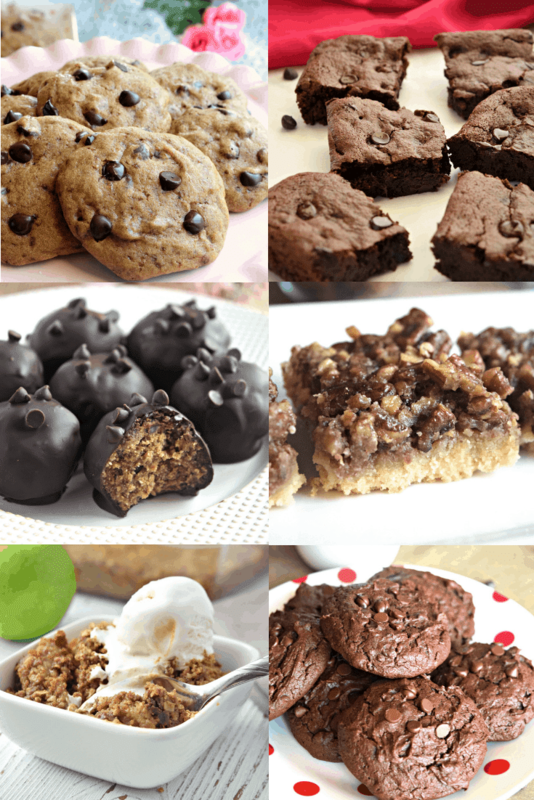 LOOKING FOR MORE GLUTEN FREE VEGAN DESSERT RECIPES? CHECK OUT SOME OF MY FAVORITES BELOW! I made the cake in a mug. The consistency was not like cake. But it was very good. I did microwave till all liquid was gone. The next time I think I need to cook a little longer. I look forward to reading all your recipes, etc. Hi Pamela! Thank you so much for your feedback! The texture won’t be exactly like chocolate cake that gets baked in the oven because it’s made in a microwave, but you should still get a nice crumb in the cake. I definitely would try cooking it a bit longer. So glad you still liked it! Thank you again!